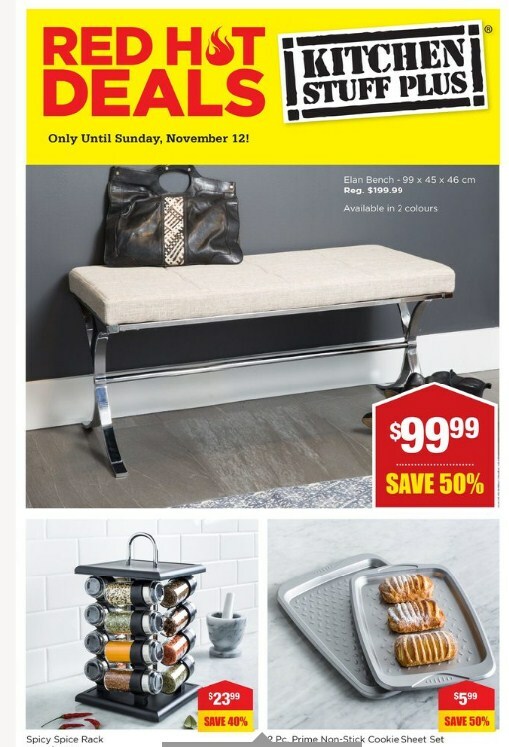 Kitchen stuff plus Ontario flyer, November 6 - 12, 2017 , KSP Elan Bench Model : Regular Price $99.99 Sale Price 50% Savings Sit comfortably on our Elan Bench. 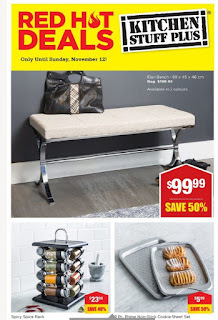 Perfect for entry halls or occasional seating when extra guests visit, this sturdy, lightweight bench features a soft, padded seat and durable metal base.KSP Prime Non-Stick Cookie Sheet - Set of 2 Model : Regular Price $5.99 Sale Price 50% Savings Bake delicious cookies or your favourite frozen snacks on these Prime Non-Stick Cookie Sheets. The 'sheet metal' texturing helps create an exceptional non-stick surface and the wide edge handles make it easy to life and carry these pans to and drom the oven. KSP Spicy Spice Rack Model : Regular Price $23.99 Sale Price 40% Savings Easily access all of your favourite spices with the Shake Spice Rack. This is stainless steel lazy suzan-style spice rack turns 360° and holds 8 glass spice jars with lids and shaker tops (included) KSP Elite Salad Spinner (Stainless Steelgreen) Model : Regular Price $29.99 Sale Price 50% Savings Create fresh and delicious salads with our Elite Salad Spinner. The lever activated spinning mechanism makes it easy to remove excess liquid from your salad and the non-slip base grips securely to your countertop for easy spinning. The stainless steel spinner doubles as a stylish serving bowl, allowing your to use fewer dishes. When you're done making salad, the lever locks into place for easy storage in your kitchen cupboards. KSP Demi Tufted Faux Leather Barstool Model : Regular Price $59.99 Sale Price 40% Savings Sit comfortably on our adjustable Demi Tufted Barstool. 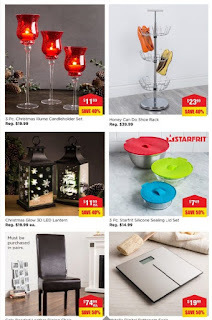 This stool is great for a relaxing evening around your home bar or enjoying dinner at your kitchen island. 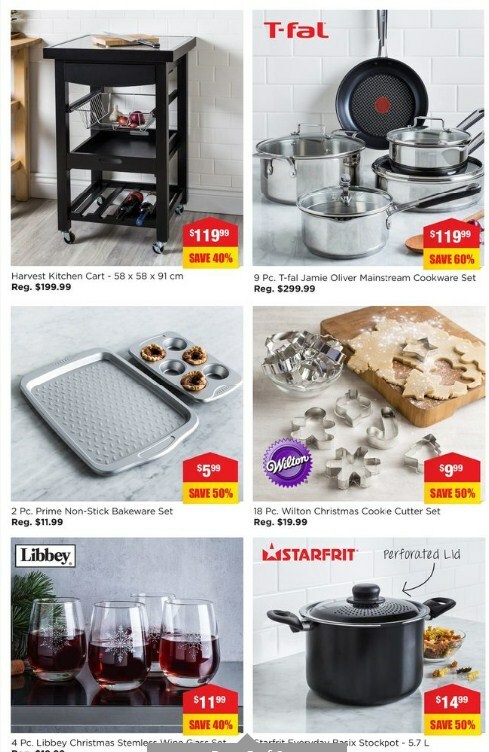 Starbasix Tri-Ply Non-Stick Frypan Kitchen stuff plus flyer (Stainless Steel) Model : Regular Price $19.99 Sale Price 50% Savings Cook your favourite foods in this easy to use Starbasix Tri-Py Non-Stick Frypan. 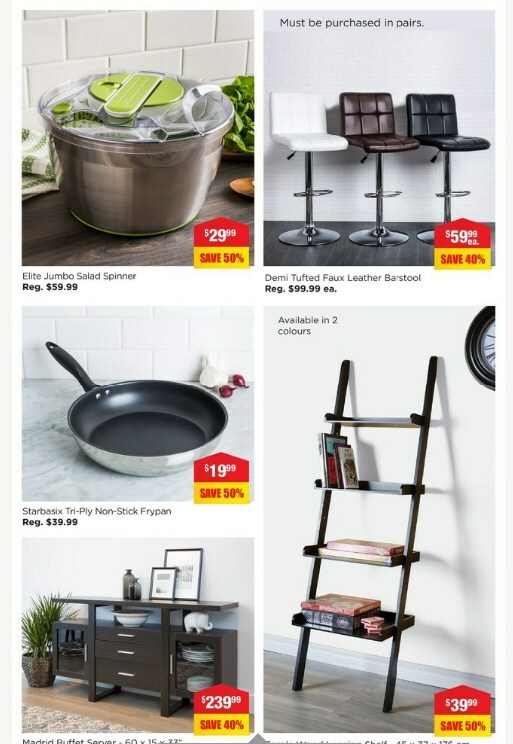 Easy to clean non-stick coaking is best washed by hand.KSP Escala 4-Tier Wood Leaning Shelf Model : Regular Price $39.99 Sale Price 50% Savings Great for living rooms, bedrooms or dens, the Escala Leaning Shelf is a great way to add storage to any room. 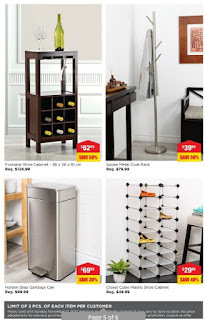 Easy to assemble, the Escala Leaning Shelf can be placed against any wall.